Boone County was founded in 1820 by settlers moving westward from Kentucky, Tennessee, and Virginia. These pioneers were drawn to the area’s rolling foothills, wide open prairies and scenic bluffs overlooking the Missouri river. Originally known as Boone’s Lick Country, the settlement was named for the nearby salt lick operated by Daniel Boone’s sons. In 1839, Boone County became home to the ﬁrst Land Grant University established west of the Mississippi. Today, Boone County sits at the crossroads of major highways and is a regional hub for commerce, healthcare, and innovation. Known for its outstanding quality of life and cultural activity, Boone County continues to be one of America’s most desirable places to live, work, and do business. For fast access to Boone County forms, search applications, reports, and other services please select a service from the drop down menu. 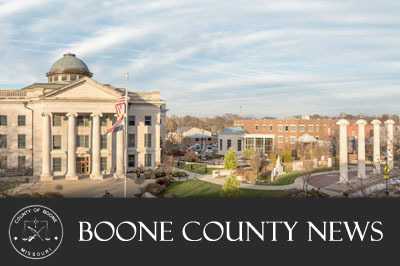 Subscribe to the Boone County News email list. This list sends out approximately one email per week. You can subscribe or unsubscribe at any time.